May - 12 | By: Molly King | no comments. 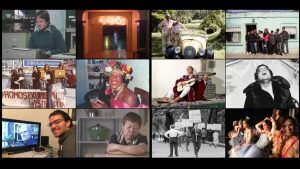 Going on its 11th year, QDoc is the only film festival in the United States (and one of only two in the world) devoted exclusively to LGBTQ documentaries. From historical films to personal stories; artist biographies to experimental works; topical films to controversial works, QDoc has presented award-winning films, fresh from top-tier festivals, for more than a decade. The four-day festival kicks of Thursday, May 18 at the historic Hollywood Theatre and continues through May 21 with 11 additional films, broadly exploring LGBTQ history, culture and politics. This year, we pay tribute to a beloved storyteller and gay rights pioneer (THE UNTOLD TALES OF ARMISTEAD MAUPIN), we meet a legendary LA club owner and trailblazer (JEWEL’S CATCH ONE), we journey through the life of a Latin-American singer and icon (CHAVELA), we revisit the era of McCarthyism and elicit parallels with today’s political landscape (LAVENDER SCARE), we celebrate the joy of an all-male, comic ballet troupe founded more than 40 years ago (REBELS ON POINTE), and so much more! Check out the full film schedule at QDocFilmFest.org and we’ll see you at the movies!